Have you ever been so steamed that you came unglued in a public place? That happened to me once, more than a thousand years ago. I blame my misfortune on your relentless obsession with hot baths, especially the Turkish kind passed on to the Ottomans by the Romans I knew so well. You hygienic humans love to relax in them, but for me, all that steam was a hiss of death. Long ago it loosed my grip and sent me into a downward spiral that ended in the darkest of places. I am better now, and it helps to talk about it—so here goes. Arabian by birth, Indian by design and Roman by trade, I know more than most about the hardships of living in your human world. Toppled obelisks and exploding temples have nothing on me, for I had a white-knuckled tour of duty on the hand of a Roman imperial soldier. I would prefer a view of the Aegean Sea or the Nile Valley any day to watching men die a mere sword-length away. I am, after all, a gemstone of red jasper from the Arabian Peninsula, something prized among your spiritualists as a healer and bringer of peace. I therefore made no complaint when someone carried me off to a workshop and into my mineral flesh carved a picture—quite a pretty one. I bore the intaglio image of a distinctive parrot perched on a leafy branch. Borrowing the Latin of theserviceman who later owned me, the winged creature is nowadays known as Psittacus torquatus, an alluring green squawker with a bright red neckband, a hooked beak and a long, plumed tail that curves jauntily upward. These exotic birds hailed from north India, but merchants hauled them west in fancy cages to eager buyers in the Levant and across the Mediterranean. One of them appears in a mosaic from the Pergamon acropolis in modern-day Turkey. 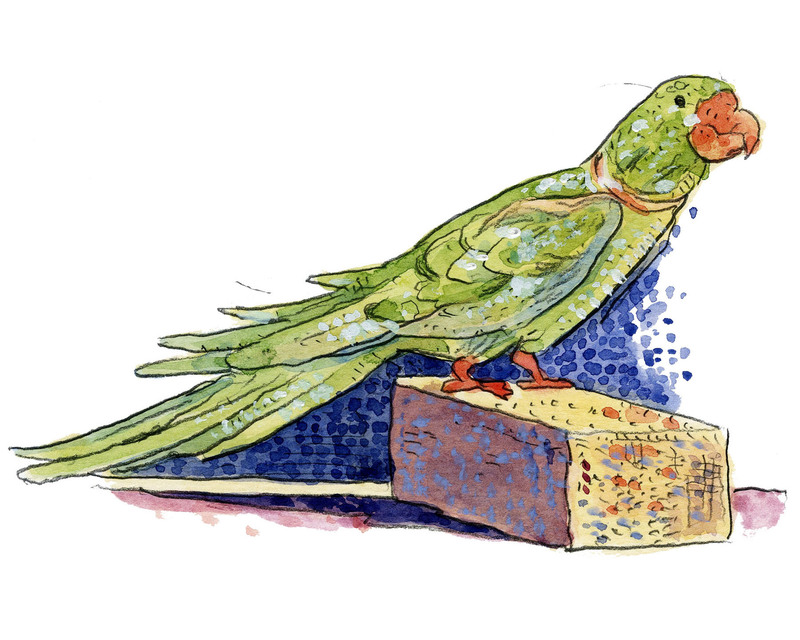 Prized as companions, these parrots can be trained to chatter in many of your human languages. According to Pliny the Elder, patriotic Roman citizens taught them to screech “Ave Caesar,” but he added that these birds tended to fall forward onto their heavy beaks. For such creatures, Roman poets wrote elegies. With such an image emblazoned across me, I guess it is no wonder that I can speak to you so well. My next adventure was to be trimmed around my edges, into an oval that measures about 14 millimeters wide. I was then set into a sturdy iron finger ring, where I became a personal signet. But about all who possessed me, I cannot tell. You see, a signet must pledge loyalty to its latest owner, forswearing all before. I still faithfully serve the Roman warrior who acquired me last, and none before him. He was a typical man of his times, muscled and mouthy. Against my nature, I occasionally had to punch those who angered him, leaving a little parakeet bruised into the offender’s jaw. Sometimes I was swung too slow, and it was my bearer who toppled, ironically, onto his own heavy beak. At his bidding, I journeyed to lands far from Arabia and India. He served his master as I served mine. Roman soldiers lived most of their adult lives in the legions, taking up posts along the vast frontiers of their empire. Many of them wore rings like me, each set with a small but impressive treasure carved from jasper, cornelian, nicolo, amethyst, plasma or quartz. Every gemstone bore a specially chosen image. 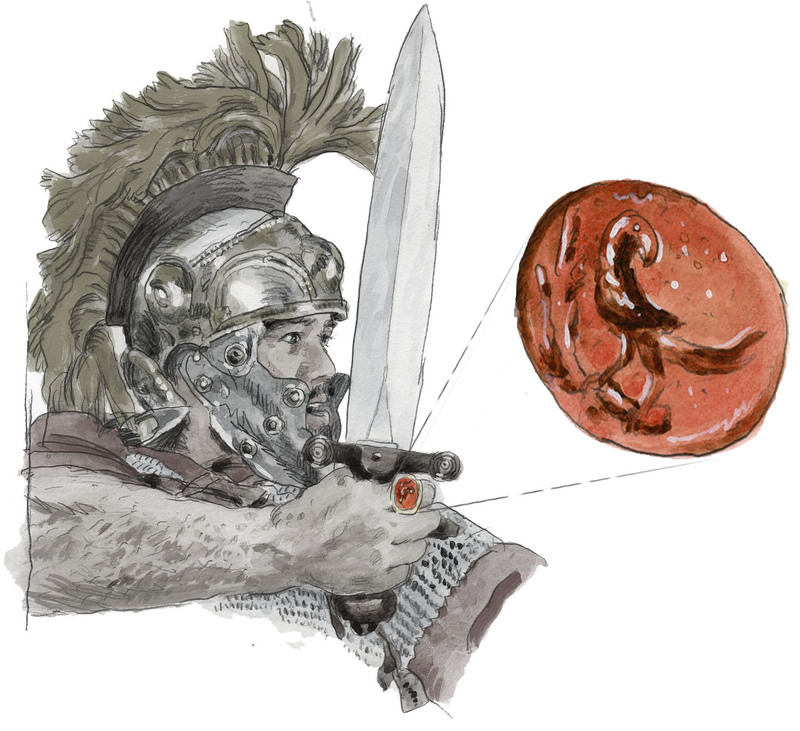 Some types you would naturally expect as adornments of fighting men: imperial eagles, heroes, horsemen, weaponry, and fierce deities such as Mars. Other stones betray their abiding concern for safety and prosperity with depictions of cornucopiae, money bags and deities of health and fortune. I suppose my parrot meant something personal to my ring bearer, perhaps an homage to a lost pet. Then, too, my owner may simply have liked the exotica of the East and the sense I conveyed of the wondrous world he watched over. To each his own. Eventually, my bearer and I traveled about as far west as we could go, all the way to the frost-fringe of the known world, a region now called Wales. There he soldiered with me until the fateful day we parted company, the day my life went down the drain. I mean that literally, for I spent nearly 2,000 years clogging a drainpipe that emptied the baths of Rome’s Second Legion Augusta (ii Augusta) in the province of Britannia. Yes, I was lodged in that filthy prison by the swirling bathwater of thousands of soldiers and their dependents, the compatriots of my erstwhile ringbearer. 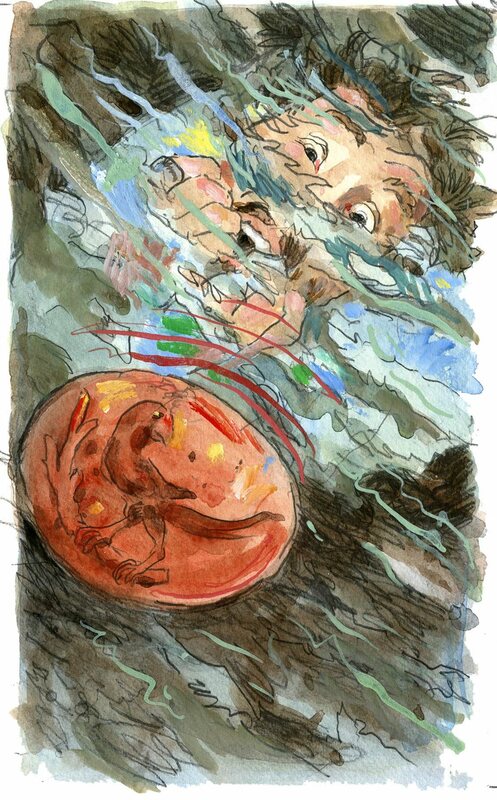 I was hardly alone there, and I shared this unpleasant fate with many other inmates, including the soggy carcasses of frogs, rats, cows, sheep, pigs, fish, ducks, geese and other fowl things. Mostly there were table scraps dropped by bathers. I lay surrounded, too, by shattered glass, broken pots, nails, and a collection of human teeth. If you have ever felt revolted by the sight of a giant clog, imagine me, living in one, for centuries. I would have given the entire orbis terrarum to see the bright skies of Arabia again. It was all dark, damp and deeply depressing. My long nightmare took place specifically in the central drain underneath the main building of the military base at Isca, now called Caerleon, or “Fort of the legions” in Welsh. 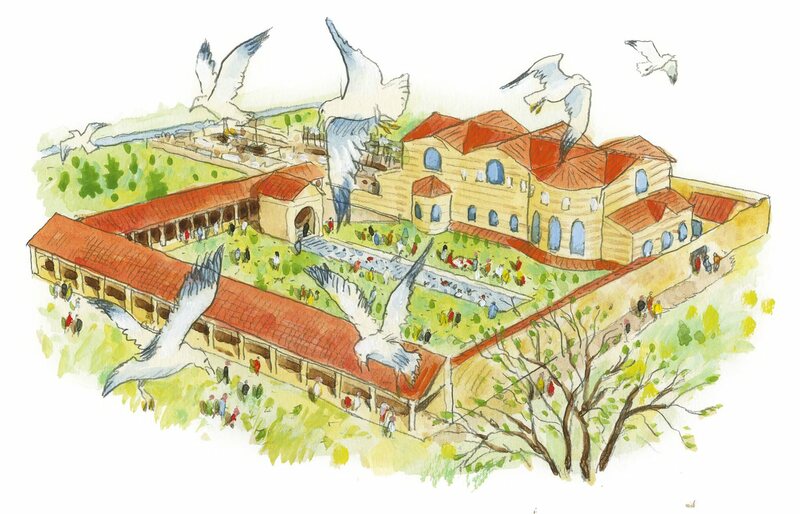 The Romans built the original camp on virgin soil during the reign of first-century-ce Emperor Vespasian—“Ave Caesar,” as the parrots might say. Isca became the home of ii Augusta, which had previously served in Hispania and Germania. You might remember Vespasian for his engineering miracle, the Amphitheatrum Flavium, now known simply as the Colosseum. But baths, which the Romans called thermae, like those at Isca, reflect the true zeal of Rome. Why conquer the world if you cannot keep it clean? The industrious Romans constructed public baths wherever they soldiered and settled—a legacy passed down for centuries in the Levant. In fact, it was around the turn of the 10th century that Hilal al-Sabi’ reported that the Abbasids had out-built even the Romans by constructing some 60,000 bathhouses in Baghdad alone. Nothing so grand took place at Isca. In 75 ce the local Silurian tribe watched from their thatched huts as soldiers in the thousands erected for themselves a little Rome away from home. The provincial governor happened to be a general named Sextus Frontinus, an expert on water supply and the author of a book about aqueducts. Like the servicemen of every caesar, men like Frontinus were the busy builder ants of the Roman Empire. 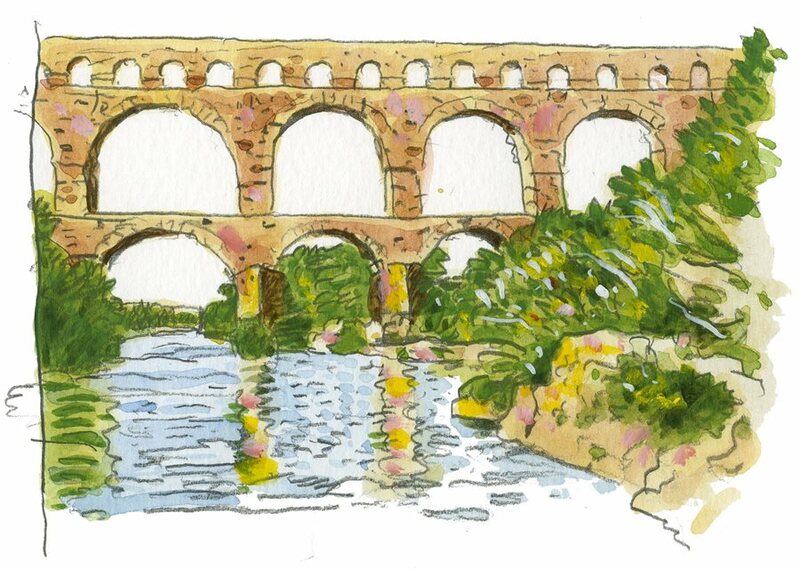 They fabricated the finest roads, aqueducts, bridges, amphitheaters, basilicas and—yes—baths. As Isca’s largest structure, the massive thermae aimed as much to impress the Silurians as to improve the lives of the legionnaires. I know I should not blame the boys of ii Augusta for building the baths that became my prison; they meant well, all 5,000 of them and their families. The latter, of course, were something new by the time I reached Isca. Until the reign of Emperor Septimius Severus, Roman soldiers had to stay bachelors until their discharge after an enlistment of about 25 years. Once the Romans started building permanent garrisons like Isca, soldiers gradually became less mobile, making it possible to marry and more or less settle down. 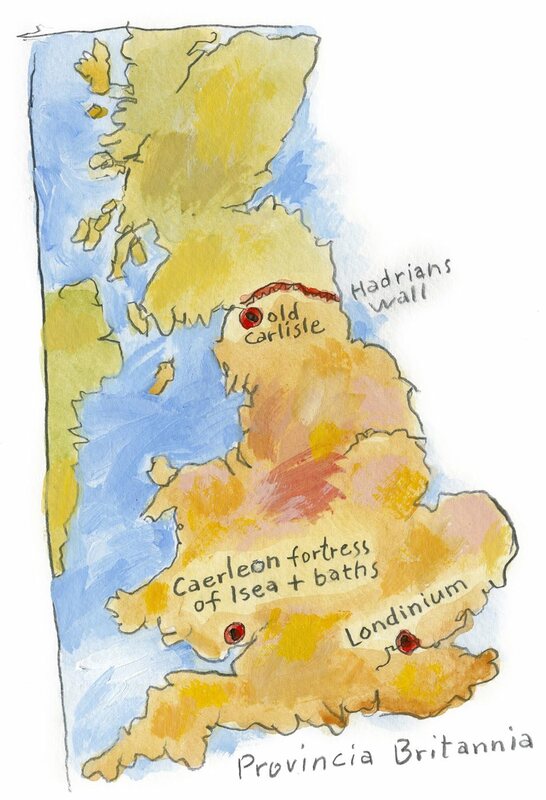 Legionary fortresses, like the three built in Britannia, slowly became cities as their bustling canabae (civilian suburbs) expanded around the original military camp. These areas included family housing, shops, taverns, temples, private clubs and so on. Why enlist for such a long life in the legions? 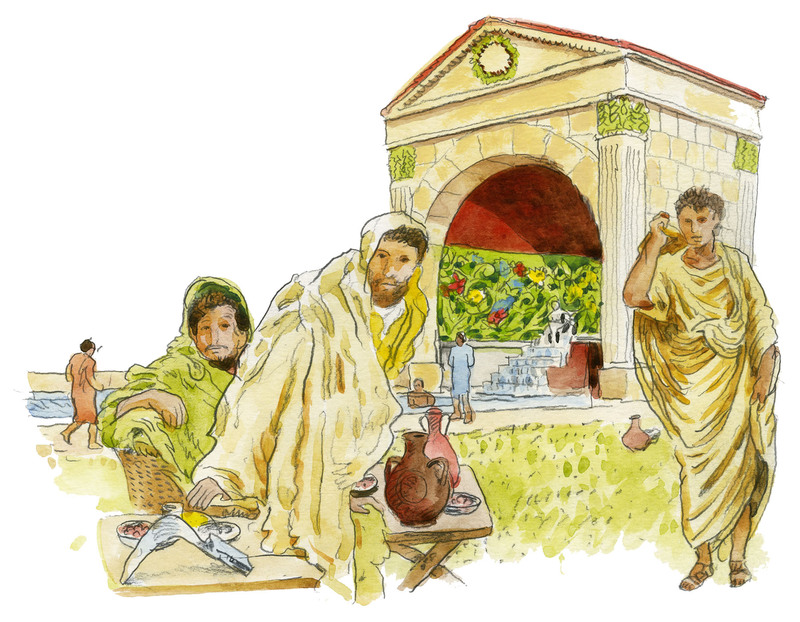 Well, besides a regular bath at the thermae, you got job training, medical care and money. I remember the smile on the face of my ringbearer, early in the third century ce when Severus’ son, Emperor Caracalla, announced a salary increase of about 50 percent. Not shabby at all, but then his smile dimmed with the news that Caracalla also debased the currency at the same time: Give a gift but take some back, I learned, was something of an imperial motto. The government was trying to stretch its silver while also keeping the legions happy. Times were tough with wars up north in Caledonia, now Scotland—where Severus died—and there were problems along the Danube frontier and big trouble brewing in Syria. Quite a few lads in the ii Augusta had to be temporarily redeployed to these hotspots. Their departures, called vexillationes, left the ranks awfully thin at Isca. It was about this time that I slipped from my soldier’s hand and, worse, slid down the main drain beneath the baths. How sad I was to see those familiar surroundings gurgle out of sight above me! I remember fondly the palaestra, that colonnaded exercise yard and, in case of poor weather, the basilica, the vast indoor training facility; the natatio, or outdoor exercise pool, stretched alongside the baths holding 365,000 liters of water. Attached to the natatio used to be a beautiful nymphaeum, a fountain-house that cascaded a continuous supply of fresh, clean water into the pool below. The baths themselves constituted a soaring edifice of brick and concrete faced with dressed stone. Tall glass windows towered overhead, framed by gaily painted walls beneath an amazing triple cross-vaulted ceiling accenting the thermae’s three main chambers. Mosaics decorated the waterproofed interior like an art gallery. Even though the Usk flowed nearby, bathers did not rely on river-water. Such a source could too easily be fouled, so spring-water was drawn down from the hills about eight kilometers away. That explains the coal-dust that afflicted me in the drainpipe, brought there as tiny traces from the coalfields located near the spring. My memory, you see, is still keen, and at times it was all I had to keep my spirits up. So many times did I observe firsthand the rituals of my bearer and his countrymen bathing. After a bracing round of exercise, or simply to relax in the afternoon, they entered the baths and undressed in the heated apodyterium. There, bath attendants guarded (not always diligently, I heard) everybody’s clothes and other personal belongings. The first of three bathing rooms was the frigidarium because, obviously enough, it featured cold water. The patron could take a dip in a cold plunge bath and perhaps oil down, scrape away dirt, dead skin and sweat along with a splash of the facility’s perfumed body oils. All of this slurry drained into the main pipe, either through subsidiary lines in the basins or through a large grate in the center of the room. Next, our bathers circulated into the tepidarium, which featured warm water and, finally, the caldarium, which was the hot room. The floors of these two chambers were raised on piers so that furnaces could deliver heat underneath them. This ingenious hypocaust created a steam system and fueled hot bathing pools. Hollow channels in the walls funneled this warmth upward, and in the bitter winters of Britannia, this felt like a miracle to the patrons. Thoroughly refreshed, the patrons wandered back through the building to the apodyterium to retrieve belongings, get dressed and leave. Mind you, from what I observed, all of this activity at Isca sounded just as loud, and smelled just as strongly, as anything in the more famous imperial baths in Rome itself. 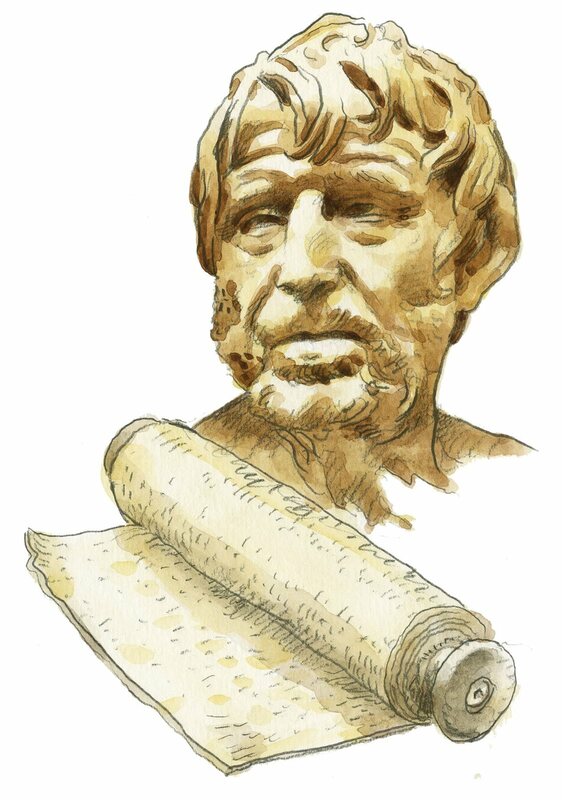 If you haven’t had the pleasure, unroll a copy of Seneca’s epistles, and read for yourself. He describes the bellowing and grunting of the patrons, some of them wheezing while trying to lift weights, others crooning as if in love with their own voices, and arguments as hot as the caldarium when they came to discussing sports. You’re deafened by the slapping of expert hands during a massage. Oblivious blokes sing in the tubs or thrash around in the plunge baths, carelessly dousing water on everyone. Professional depilators make grown men cry as they pluck unwanted hairs from armpits and other places. Food vendors stroll the rooms, hawking sausages, cakes and other delights, some snacks, some whole repasts. Their aromas mingle with sweat and filth for a memorable experience. Imagine gym class, lunch and bathtime all rolled into one. The by-products of this recreational activity usually got swept in my direction. Lead drainpipes linked together all the plunge-baths, tubs and pools of the entire complex, so whatever hit the floor or dropped into the basins would end up where I finally did. In the old days, that journey started in a brick-lined underground channel 60 centimeters wide and 70 centimeters high, sloped with a precise downward gradient. It ran below the building and, some 12 meters beyond the baths, made a sharp left turn in order to travel alongside, rather than beneath, the outdoor exercise pool. That abrupt bend was a mistake, for it disrupted the flow of water. Within a quarter-century the main drain became so congested that drastic measures had to be taken. During the reign of Emperor Trajan in the second century ce, soldiers remodeled the thermae. They raised all its flooring, unroofed the drain and called on engineers and artifices plumbarii—you call them plumbers—to assess the problems. Their solution was to lay down over the debris a new base of stones and to heighten its walls—in essence building a larger drain on top of the older, clogged one. This new channel was 1.3 meters high, with gentler turns to improve the flow of water. For a while, it drained with the best of the empire’s conduits. Yet, a century later, there I got stuck, by then beyond the reach of even the finest artifex plumbarius in the land. Like cellmates in the dark, those of us incarcerated in the clogged drainpipe shared miseries in whispers. Beneath me, in the older layer of trash, we heard muffled cries from the detritus of Isca’s beginnings. Those old-timers formed a distinctive group washed down when the aboveground bathers consumed only light snacks, mostly mutton chops, chicken legs, shellfish, eggs and pork ribs. The later legions acquired a taste for heartier fare, and we saw how they filled the upper part of the drainage channel with bones from bigger cuts of meat. In my day, bathers devoured whole meals while relaxing. I’d like to believe that the occasional rodent and frog that came down to join us had been an intruder dispatched in the baths, not something on the menu. I was never quite sure. With more substantial foods came more dishware, poking us with shards of bowls, plates and drinking cups. Since the meals had been prepared off-site, I was at least spared the company of cook-pots and frying pans. Nothing was free, so patrons brought money to pay for these meals and some of that, too, trickled down to me. Not that I could use it. The oldest coin I ever saw was already more than 360 years old when it rolled down: a silver denarius from the Roman Republic, and probably some unlucky soldier’s lucky talisman. Plenty of games were played in the baths, so along with wagers, a few dice and game pieces came my way too, either through carelessness or tantrums. Women and children were there too, always in time-slots separate from the men. Bits of jewelry and numerous lost hairpins tell their tales, the latter a losing effort to keep elaborate coiffures high and dry in the baths. Even though I remember their shrieks and laughs, I can prove to you the presence of kids by their jaw-droppings. I met a handful of human teeth over the years, and some of them were milk-teeth. I’m guessing the older, decayed molars down here were pulled by a barber/dentist, since among Romans the same guy did both jobs. I, of course, was never the only gemstone in the clog—hardly. Our roll call eventually included 87 others: 32 in the older channel below and 55 up in the newer drain with me. Every time one of my fellow gemstones took the plunge and joined the clog, we could hear its desperate owner wail after it, with one eye squinting through the drain cover at the hopeless situation down below. I doubt they regretted the cost of the stone as much as its sentimental value. That was the dilemma, you see. Patrons never liked to leave their talismans in the apodyterium, where they might be stolen. Besides, the soldiers needed their rings to protect them from evil forces that allegedly grew more potent when men were without their armors, leathers and weapons. Of course, gamblers among the lot simply had to wear their good-luck charms. These concerns convinced most Roman bathers to accept the well-known risks of losing gemstones in the thermae. Set into iron rings using bitumen or resin, the steamy, wet conditions easily loosed stones from their mounts, sending them slipping off down the drain and into the sludge that was my millennial home. in 1979. By then, the plumber had a new title—archeologist. A non-Roman, his name was David Zienkiewicz. The ii Augusta, and with it the empire it protected, were long gone when I emerged from the drain. Liberated at last from my prison, I enjoyed—with no loss of irony—what I had craved for centuries: a nice long bath. I and the other leavings of the lads and ladies have since found a refreshing, dry, well-lit home in the National Roman Legion Museum at Caerleon. Of all the engraved gemstones to gaze upon in these fine new barracks, I am surely the most impressive. After all, you might expect to see gods and goddesses, horses and chariots, soldiers and weapons. But I am the epitome of the Pax Romana that allowed a stone from Arabia to capture a charming little chatterbox from India and bring it to Wales perched on a Roman’s finger. Think about that the next time you sink into a nice warm, civilized bath. Norman MacDonald lives in Amsterdam, and he is a frequent contributor to AramcoWorld. Frank L. Holt ([email protected]) is a professor of history at the University of Houston and author of Into the Land of Bones: Alexander the Great in Afghanistan.